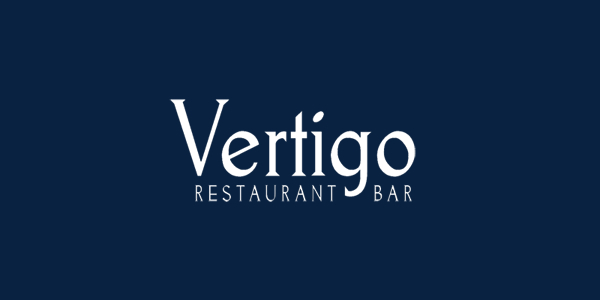 I arrived at Vertigo knowing very little about it other than they claim on their website to be a ‘fine-dining/modern cuisine’ restaurant and the reason for my visit, that they were nominated for 2 awards in the Manchester Food and Drink Festival 2011 awards. For ‘Best Newcomer’ and their head chef Ian Armstrong was nominated for the ‘Chef of the Year’. I arrived exactly on time for our 8:30 reservation but was told that the table wouldn’t be ready for around 15mins and asked to take a lift up to the bar on the 3rd floor whilst we waited. Not a problem I thought, I often enjoy pre dinner drinks. Unfortunately from the moment we set foot in the bar it became clear that would not be the case on this occasion. First we were hit by the incredibly uncomfortable heat, it’s fair to mention that Manchester was experiencing an ‘Indian Summer’ and it was very hot and humid outside at the time but the heat in the bar was unacceptable. The second big problem was that there was nowhere to sit, although that turned out to be less of a problem as we would spend over 25 minutes stood at the bar waiting to be served. The single barman was struggling to keep up with demand and whilst I appreciated that he was busy his customer service skills were severely lacking. My partner ordered a cocktail from the menu, I asked for a Mojito which bizarrely is not included on their drinks menu but the barman assured me he could make. I then watched him make several drinks for other people including my partners and many which were ordered after mine, by this point I had been stood at the bar for over 20 minutes. He then began to open and close cupboard doors, the fridge and appeared to be franticly looking for something. My heart sank as I knew exactly what was coming next. “I’m really sorry but we have no mint”, so after a 20+ minute wait I ordered a Margarita instead, unfortunately it was a disappointing Margarita too. We were finally taken down to our table on the second floor at 9:10, 40mins late. Thankfully (and amazingly considering how close we were to the open kitchen) it was much cooler and more comfortable which was good. What wasn’t good was the decor, I have never seen a more shiny and sparkly restaurant. I know it’s Manchester but it really is more like a 70s nostalgia bar than a ‘fine dining’ restaurant. 50 minutes into our visit and we were finally given something to eat. Bread, which is something I particularly enjoy when visiting good restaurants. This bread however neither looked or tasted particularly appealing. There was nothing exactly wrong with it, it was fresh enough but just unremarkable. Thankfully things picked up from there. We ordered the tasting menu and a bottle of Pinot Grigio which was reasonably priced at £23 and very good. The ‘first course’ of the tasting menu was a Tomato Consomme with olives, baby herbs & broad beans. I say ‘first course’ as I have never experienced a restaurant that counts the amuse bouche as a numbered course in a tasting menu before. No matter what the course was called or numbered, it delivered on flavour as a consomme should and was most enjoyable. Next up was a Roulade of Ham Hock, Cornfed Chicken and Pistachio with a Pear and saffron chutney, sour dough toast and ale jelly. 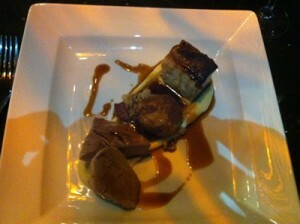 A nice dish with a good combination of flavours although, personally I found the ale jelly just slightly too sweet. The fish course was next, Hot Smoked Salmon, beetroot risotto, soft herb veloute and Parmesan crackling. It looked as good as it sounds, the beetroot risotto was absolutely fantastic, deep purple colour, soft and creamy with just the right amount of bite and incredible flavour. The Parmesan cracking was also very good but the salmon was slightly overcooked, probably the result of being sat on the hot plate for at least 10 minutes before being served to us. A real shame as the dish was so good in every other way. The main course or meat course was the dish i’d been most looking forward to: Filet of Mid White Pork, Bubble and squeak, celeriac puree, champagne sauerkraut, scrumpy cider sauce. Like the fish dish it looked worthy of coming out of a ‘fine-dining’ kitchen but didn’t quite live up to it on taste. The accompaniments where all very good, the bubble & squeak, celeriac puree and the cider sauce in particular and the flavours worked brilliantly together but the pork was slightly dry and lacking in seasoning which was disappointing as again it was so close to being a great dish. The dessert was Plum and Ginger Crumble with Cardamon creme anglaise, orange sorbet and nectarine. It wasn’t a good end to an already very up and down experience. The sorbet and nectarines were brilliant and complemented the flavours and texture of the crumble perfectly. As with the previous 2 dishes, the accompaniments were far better than the main event as the crumble was average at best, the stewed plums were tasty but I struggled to pick up the ginger, the crumble topping was more of a granola which appears to be sprinkled on top of the fruit rather than cooked together with it and the cardamon custard was almost cold and lacking in cardamon flavour. Overall it would appear that our experience at Vertigo was not very successful. However I found it more frustrating than disappointing as there were many positives. I don’t know if Ian Armstrong was in the kitchen at the time, I suspect that he wasn’t and was let down by his team on the night. There is no doubting that he is an accomplished chef as there were some touches of brilliance on many of the dishes and I experienced some exciting new flavour combinations. Unfortunately they were let down by some basic errors which shouldn’t happen in any professional kitchen, particularly one that claims to be ‘fine-dining’.